This is another release by a band that this reviewer hadn’t heard of, and consequently would not have come across. 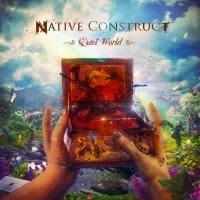 The band is called Native Construct and the title of their debut album is Quiet World. The band is a collaboration between students started in 2011 at Berklee College of Music in Boston, Massachusetts, where I’m informed, a certain Dream Theater, also originated. The album, Quiet World, is a concept album dealing with the tale of Archon and The Silence, the inhabitants of the Quiet World. The style of the band hints at Dream Theater, Pain of Salvation, Queen, Between The Buried and Me, and should suggest what is to be found on Quiet World. There is a musical amalgamation of classical with musical theater via prog metal. Native Construct is made up of three members, Myles Yang (guitar, programming), Robert Edens (vocals) and Max Harchik (bass). The album, Quiet World, clocks in at around 48 minutes, with 7 tracks in total. The longest track on offer is the final track, track 7, “Chromatic Aberration” which plays for 12:28 minutes with the previous track, track 6, “Chromatic Lights,” the shortest at only 2:14 minutes. The opening track on Quiet World, “Mute” (6:34); I have listened to many times because of the range of styles present in such a short time. Starting atmospherically, it soon explodes into action with a full band blast, including a vocal that just about holds its own against the instrumentation. A twist soon sees the track head into jazz territory before 2 minutes have elapsed, with some very nice harmonies and a little show of guitar work from Myles. A further shift around 3 minutes brings in a sublime little passage of gentle instrumentation and harmonized singing. This is then a cue for the “strings” to enter the fray and add a symphonic tinge with some very subtle piano away in the background. This is an excellent little section which slowly builds, but then jumps into growled vocals and metronomic drumming, which unfortunately happen to be two of my pet dislikes, but also features some amazing guitar. Despite several listens, the music loses me at the, and lets not pull any punches, death metal growls. Call it by any other name, extreme metal, whatever, but I find that growling vocals are a total turn-off. This opening track encompasses, for me, the highs and lows of what Native Construct have to offer. There is a very jazzy start to “The Spark of Archon” (9:09) which edges into the metal style very quickly with some great guitar. The vocals are more like a narrative to start but become “normal” by the 2 minute mark. There are several tempo changes early on, which serve to impede the flow of the track, as it seems to veer from place to place. The jazzy moments are very good, but at around 3:30 minutes, there is a switch to full on metronomic drumming and I start to drift. A moment or two later and we have entered a superb atmospheric melodic passage. Just after 6 minutes we again hit the metal guitar with “double pedal” drumming then the track dives back into the realms of jazz again. There is some superb guitar from the 7:30ish minute which drives the track along, with some low, and fairly indistinct, vocals. The track moves to a finale with simple instrumentation and a crystal clear vocal. “Passage” (8:23), has atmospheric passages, superb “string” themes, variable time changes, great saxophone, and then the growling starts, this time in front of some superb symphonic sounds. The final, and longest, track, “Chromatic Aberration” (12:54), has some scintillating guitar work at the outset with excellent vocals and it isn’t long before the time changes start to appear and the vocals shift towards the growl, leaving the track desperately searching for a direction to go in. Instruments vie for attention and the overall effect is, unfortunately, disappointing. As the track continues to veer from one passage to another, it simply starts to blur the track. Around the 4:30 minute mark, there is an oasis of calm, with very atmospheric music and superb vocals, giving a majestic snapshot of what Native Conflict can achieve. The track then moves off in another direction but maintains the listeners’ interest. The mid part of this track is by far the most amazing passage contained within the album. The staccato style which heralds the tracks’ exit seems to jar and the growls also reappear around 12 minutes. This listener is certainly not leaping up to put the album on again. Quiet World is a very complex album to get into as it is seems to be trying to be all things to all people, sampling jazz, rock, metal, prog, folk, classical and more. Whereas there are great examples of skilled musicianship on show throughout this album, I found the speed at which shifts from style to style happen, didn’t work and although some passages were superb, the album seems to lack coherence and seemed unfocused. I will stress again, however, that this is a very personal opinion on Native Construct and admit freely that the sound of growled vocals do absolutely nothing for me, apart from reach for the off button. Having made that comment however, I will be very interested to see (or should it be hear) the direction that the band take with any follow-up release. I enjoyed many passages on this album, Quiet World, but the chasm between extremes was simply too great.